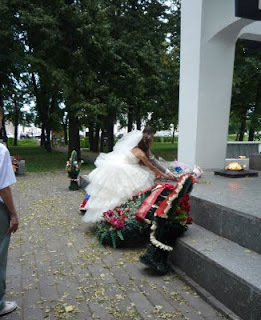 Modern Russian weddings usually last for two days. During the first day there are some very important things that happen, like the process of buying-out the bride, the ceremony in the wedding palace, the church wedding (the ceremony in the church is optional, it can take place on a different day and in case with Russian Orthodox church it can even happen years before or after the civil ceremony), then the newlyweds visit different important sites, and then there's a banquet. 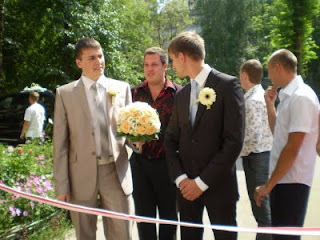 The second day is normally a smaller celebration with family and friends where people celebrate the first day of the couple as a husband and a wife. The wedding starts with a tradition of buying out the bride. 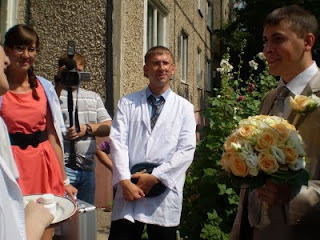 When the groom reaches the house where the bride is he has to do many funny tasks. It is an old tradition which used to literally mean 'buying out' the bride with money. Now money is still part of the process, but various tricks, jokes and funny tasks are more popular. 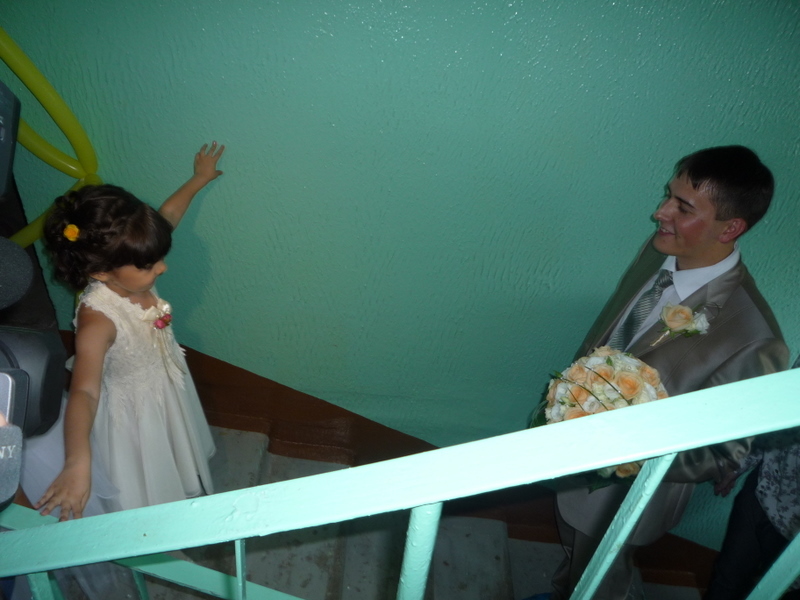 My niece decided that the first stage of her wedding will take part in our apartment because we live on the 7th floor. That way her friends could think of quite a few tasks for the groom. Since Anya (my niece) is going to become a pediatrician, the buying out process was concentrated on the topic of medicine, hospitals, medical check-ups etc. I didn't see all of it but the other guests said it was very funny. On the 7th floor my daughter was waiting for the groom. Delia recited a poem which basically meant that if Dima (the groom) wants to see Anya he needs to give Delia some chocolate (he gave her a whole box and she ate almost all of it with great pleasure the next day). 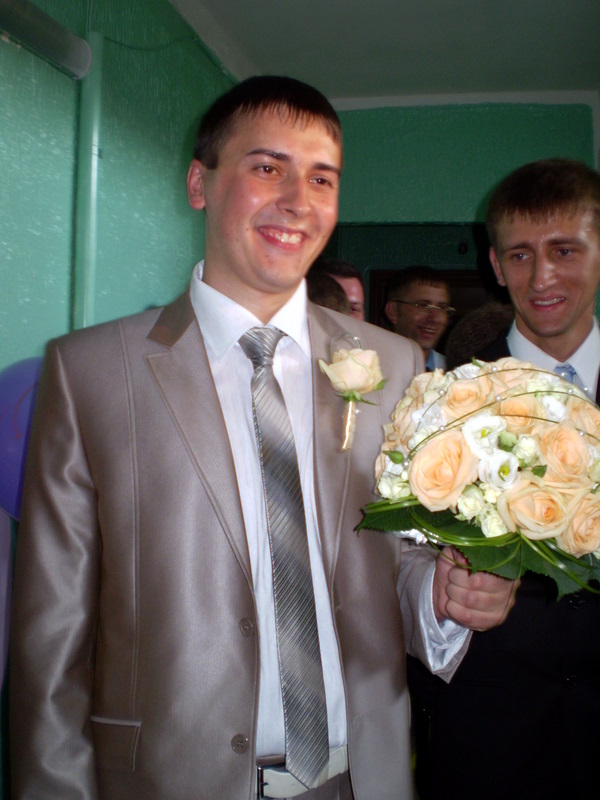 After that the groom was let into the apartment, but all the doors were closed and he had to look for his love. He found her in the living room. Then there followed some drinks and light snacks, some pictures were taken, and then the guests left. Soon the bride and the groom also went out of the house and the moment the couple stepped out they found themselves walking in the rain of coins and rose petals. This is also an old tradition. 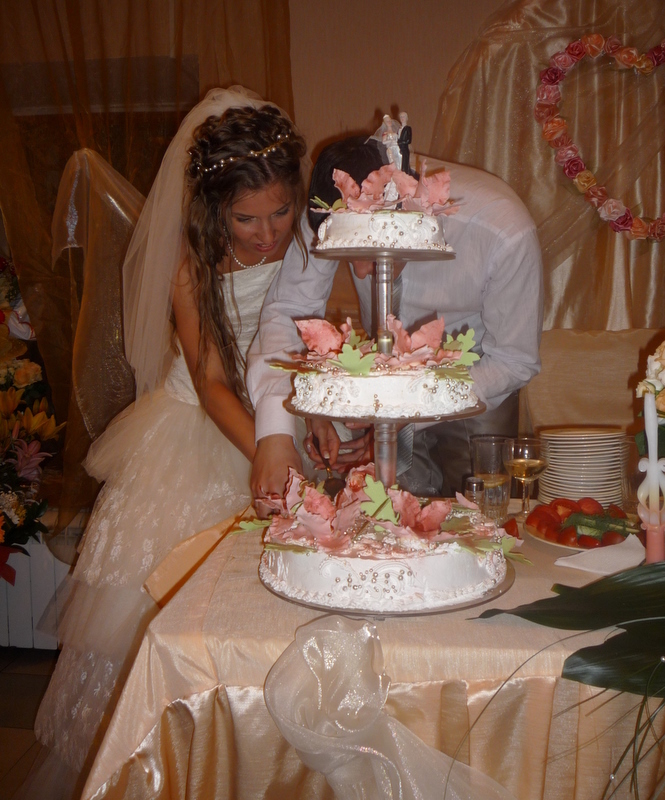 That way we show to the couple that we wish them a happy, fruitful and rich life. 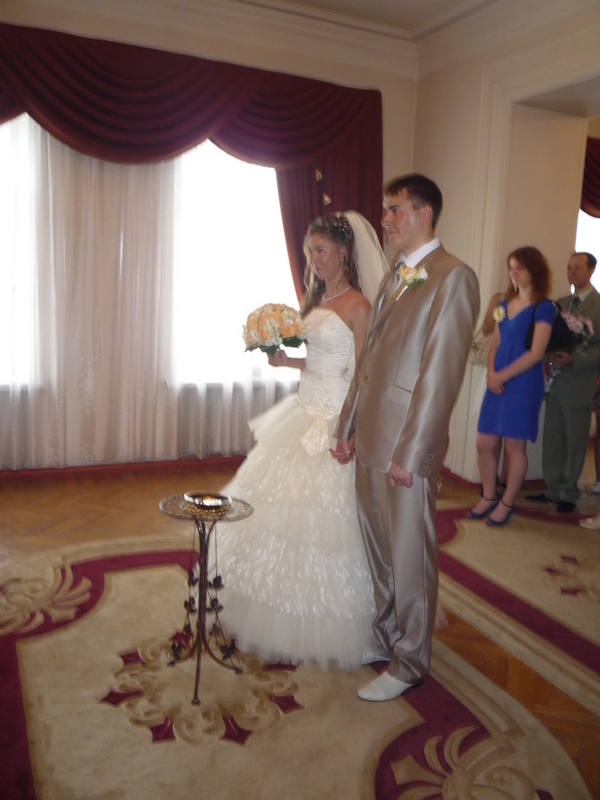 Then the couple and their guests usually go to the wedding palace. 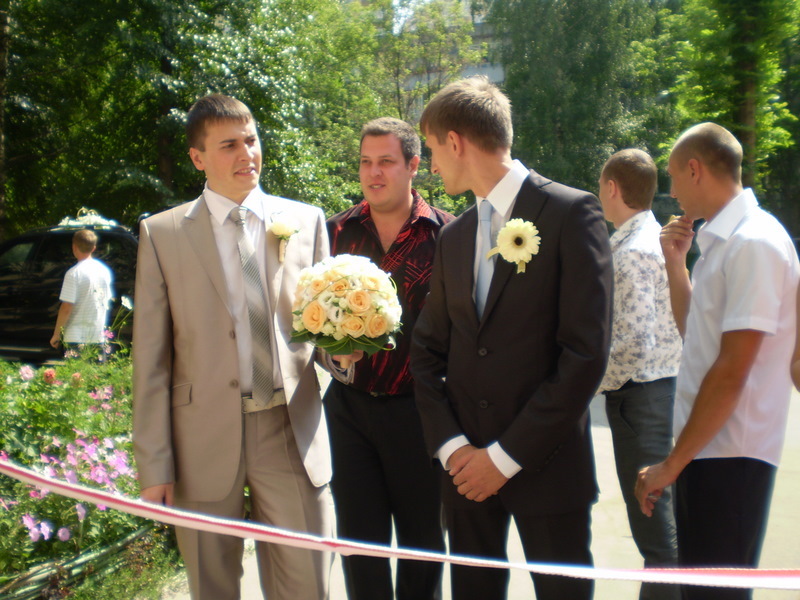 A civil marriage ceremony takes place there. 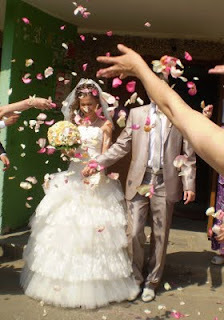 Anya and Dima's wedding ceremony took place in Suzdal, an ancient city not far from Vladimir with lots of churches, beautiful landscape and friendly people. 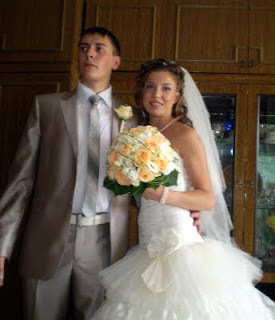 There Anya and Dima were pronounced a husband and a wife. It was a very emotional moment. Quite a few people had tears in their eyes there, including me :) As the newlyweds were leaving the wedding palace they were again showered in coins and rose petals. After the civil wedding ceremony the couples usually go (or drive) for a walk, visiting different sites in the city. Usually all newlywed couples go to the eternal flame memorial and place flowers there in honor of the memory of those who made it possible for us to live in a free country. 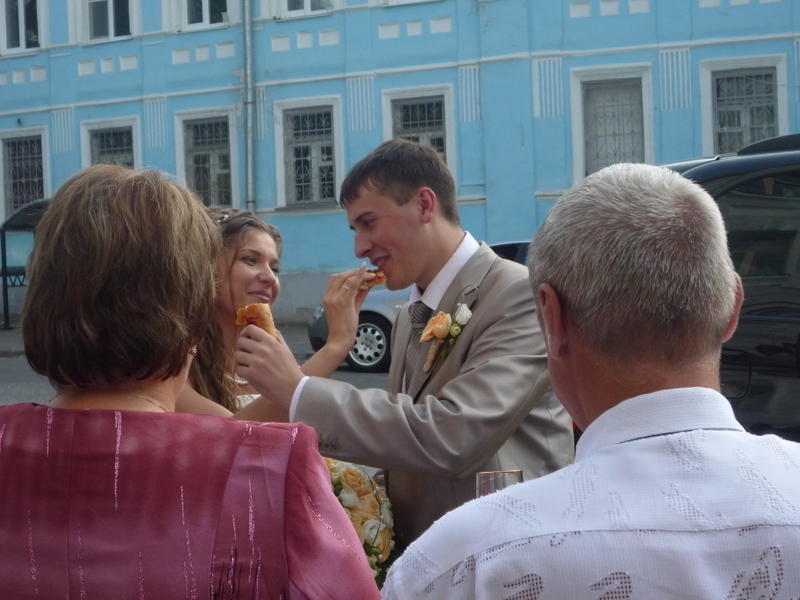 Some people are against this tradition but it is still pretty popular among the newlyweds. My niece and her husband went to the eternal flame in Suzdal. 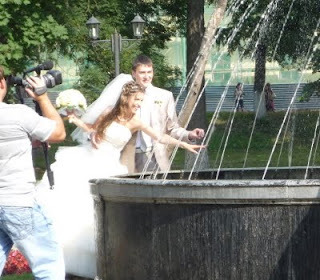 Then the newlyweds visit different sites, have their pictures taken there and just have a good time. In many weddings the husband also carries his young wife from one end of the bridge to the other. 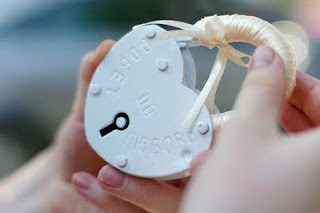 It is supposed to mean that the husband will take good care of his wife and she will trust and follow him. I am not sure if there is a specific bridge for that in our city. 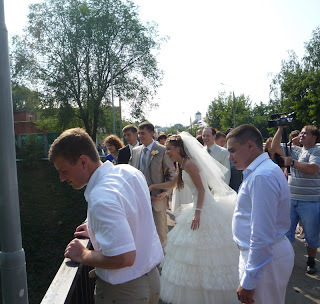 I used to see this tradition observed on one bridge, but this time the newlyweds were taken to another bridge in our city, so I guess it doesn't matter. :) Dima also carried Anya. After the walk, the time for a banquet comes. At the end of the evening Anya threw her bouquet and one of her friends caught it (I'm not at all sure it is a Russian tradition though. I rather think it was borrowed from the West). At the very end of the celebration we all went outside with a bunch of balloons filled with gas. Anya and Dima sent a big heart-shaped balloon into the sky and we let go of our small balloons (left a couple for Delia to play at home though). By that time the battery in my camera died completely and I couldn't take a picture of the balloons in the sky. The next day Dima and Anya invited their friends to a park where they made some barbeque, played games and had a good time. Hope you liked this description of my niece's wedding and got a glimpse of what our Russian modern weddings are like. Большое спасибо за такое подробное описание свадьбы! Было очень интересно читать! Таня М.